Dues Ex Machina is a phrase that has been variously translated. Today, there are people who claim it is a sign of G-d’s hand invisibly moving in our lives; the mysterious god machine. Most people have heard of the album by the band The Police, “Ghost In The Machine”. Less well known in non-psychological circles is the 1949 book The Concept of Mind by Gilbert Ryle where this term made its debut in modern times. Ryle argues against the concept of Dualism first made famous by the philosopher and mathematician Rene Descartes. Dualism is the ancient concept that the mind and body are distinct entities. The notion of dualism is the reason we have different definitions for ‘mind’ and ‘brain’. We think of consciousness and self-awareness in terms of our mind’s ability to understand itself and the world around it, yet we say the mind works within the physical construct of the brain. Descartes expounded this theory in the 1600’s in multiple treatises, including De Homine. The average reader is aware of the assertion, “Cogito Ergo Sum,” or, “I think therefore I am.” This is the most famous quote of Descartes, though from another text, and a most famous expression of mind/body dualism.What Gilbert Ryle argues against in, The Concept of Mind is this very notion put forth by Descartes. Ryle asserts that there is no mysterious mechanism occurring in the mind from which magically springs forth consciousness. He famously said there is no, ‘deus ex machina’ or no “ghost in the machine”. No magic, no mystery. We are unitary and unified beings, self-contained. Another author, Arthur Koestler, borrows Ryle’s term and publishes a book in 1967 entitled Ghost in the Machine in which he attempts to explain humanity’s self-destructive tendencies. For this exposition, Koestler expands upon the works of Behavioralist psychologists to argue that there is no mystical adjunct to humanity. For our purposes, the whole argument is really rather dry and unappealing to anyone not in the field of study in question. The practical upshot of his book however is that the term ‘ghost in the machine’ is brought forth to a wider audience: college students. That audience comes to understand that this term is derived from the works of Ryle, who was arguing with Descartes, who argued that the mind is distinct from the body; apart from it. This limited understanding allows one to form the opinion that the ‘ghost’ in the machine is our spirit or the holy. When someone today claims that something is the ‘ghost in the machine’, they usually are claiming something along the lines that the whole is greater than the sum of its part. If someone decides to translate the ancient Greek more literally, they like to call it the ‘god machine’, the mysterious machinations that make our world make sense. This last translation is closer to the truth than anything put forth so far. In ancient Greek, ‘Dues ex Machina’ literally translates as “god from the machine”. That is, god FROM the machine. Deus ex Machina is an expression most notably recounted in Poetics, by the ancient Greek philosopher Aristotle. It is a term of theatre, not theology or philosophy. The ‘god from the machine’ is literally a device used by a playwright, a bad playwright in Aristotle’s estimation, to resolve all the loose ends at the end of a play. 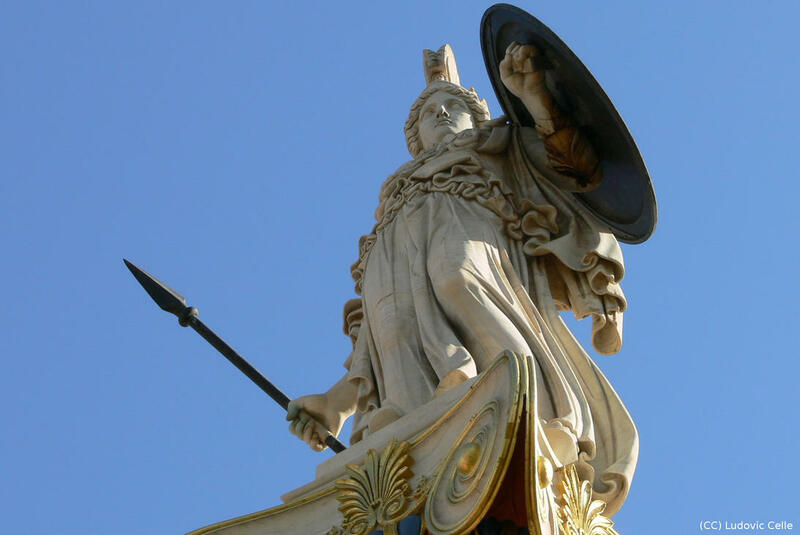 One of the Greek gods would literally descend from above the scenery via ropes, land amongst the actors, and resolve all the issues using his or her godly powers. Aristotle did not think much of this tactic. He argued that a good author should be able to resolve all the tensions and disputes internally within the structure of the play, logically, on his own. Aristotle thought is was a cheap trick to simply wave a magic wand over a mess that was created by a playwright for his characters in order to wrap things up nicely at the end. Aristotle often noted that Oedipus was the perfect tragedy for this very fact. The author made a fine mess of everything throughout the whole play but the fates that befall all the characters tie together with a satisfying closure that can be traced to their own actions within the play. There was no need to appeal to some supernatural force for things to work themselves out. You may believe in mind/body Dualism or that there is no one else home but yourself. That is not important to me. Either we are all hard-wiring or we are more than the sum of our parts or maybe there is a third or fourth option to the above two. Whatever. What is important is that ‘deus ex machina’ is a term of art created by someone less than one hundred years ago. It is a term borrowed without concern for its original context nor concern for how it may sound to the uninitiated reader. Sending down a god into a work of fiction to fix poor writing is a long walk from claiming that the lord moves in mysterious ways. Posted on April 5, 2013 by Chris. This entry was posted in I argue, Minutae, Uncategorized. Bookmark the permalink. Cool. Try this statement on for size. I am a Christian as a whole, but am a philosopher first. I think this work, as well as Aristotle’s, Descartes, or even the Bible is under the reality of interpretation by the reader. Also, reality under interpretation of the thinker. I believe there are as many valid realities as there are interpreters. Thank you for your comments. I’m glad you liked the story. I am not so sure there are as many realities as their are interpreters but I do think there are an awful lot of perspectives.